As soon as we dub the youth movement in women's tennis dead, we know it will rear its head once more. Consider this, the youngest women's major champion in the past year was a then 27-year old ex-retiree named Kim Clijsters. Today, another member of the "old guard" 31 year-old Francesca Schiavone faced a woman more than a decade her junior, Austrian Tamira Paszek, for a spot in the 4th round of Wimbledon. When we first saw Paszek at the US Open playing the junior final in 2006, she was a 15-year old can't miss prospect. A year later, she had briefly cracked the Top 40 in the world, won her first WTA title and had reached the fourth round at both Wimbledon and the US Open. Well, then...not a lot until today. Schiavone was certainly the favorite today, having recently made an admirable defense of her French Open title and having the experience of years as a WTA pro. Serving from behind, there were a number of opportunities for Paszek to lose her nerve, but this Austrian isn't an ingenue making her first run. Paszek lost half of her 2009 season to a back injury and has been making a long comeback. Paszek spent much of last year losing 1st and 2nd rounders or going through qualifiers to work herself back into the top 100. She made her way through qualifying and then the main draw to win the title in the Quebec City event last fall. Today was nearly as arduous a comeback, upsetting Schiavone 3-6, 6-4, 11-9 in 3 hours, 41 minutes to make the second week of Wimbledon for the first time since 2007. Oh, did I mention Paszek's only 20 years old? Maybe being young in the women's game is still an advantage if you're long on experience. As much as skill, technical proficiency and fitness are prerequisites for success in tennis, on a day-to-day basis it's just as important to take advantage of the luck of the draw. Living in the age of Roger Federer, the old maxim "It's better to be lucky than to be good," seems to have lost its truthiness. Federer's run of 28 consecutive grand slam quarterfinals distracts from the vital importance of showing up and getting through a major tournament healthy. Putting Federer's streak in perspective, only about 30 men in the Open era have even laced up their sneakers for 28 consecutive majors, let alone reached the business end of them. 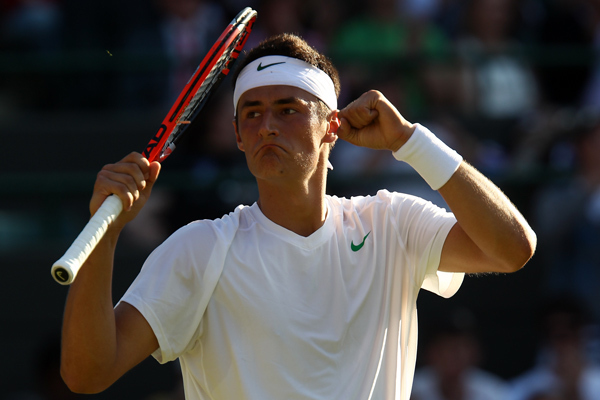 18-year old Aussie qualifier Bernard Tomic succeeded by simply being the healthier player on the day and not letting that position unnerve him. So often an unwell or injured player can win a match because their opponent can't maintain their level of play with the distraction across the net. Swedish world No. 5 Robin Soderling was not so lucky today. Presumably Soderling was downed by food poisoning as much as Tomic's cool, clam and collected performance. Even when the Swede was able to boost his energy level, the soon-to-be top ranked Australian player kept his cool, taking advantage of Soderling's errors to get himself into the second week at Wimbledon for the first time. With a thoroughly winnable 4th rounder against Xavier Malisse looming, Tomic may be the 2nd half of the season's answer to early-year hot hand Milos Raonic. Y'know who's playing great ball this fortnight? Caroline Wozniacki. The World No. 1 stared down what should have been a tough challenge against 27th seeded Aussie Jarmila Gadjosova and lost just five games, interestingly, the same amount of games fellow star contenders Maria Sharapova and Serena Williams dropped in their 3rd round matches today. With all eyes focused on Maria, Serena and Venus Williams, the top seed is being allowed to do what she often does, win a lot of tennis matches, slightly outside the glare of the spotlight. Maybe that's what she needs to win, being under the radar. Regardless of her results, she's guaranteed to be world No. 1 until at least August 1st. That will put her ninth all-time in terms of weeks at No. 1, with 44 weeks, well ahead of Venus Williams, Kim Clijsters, Ana Ivanovic and hall-of-famer Arantxa Sanchez-Vicario. Maybe that's why she seems like the most disrespected of all No. 1s, because despite the slings and arrows of the press, the bloggers and the fans; the Woz hasn't faded away. She's quietly gone on winning matches, showing off her golden fingernails and saying someday she would win that major that everyone asks her about. With other players appropriating the spotlight, maybe Wozniacki might even do it here...maybe. These types of wrist watches are designed for information through as much as 8 various satellites. tag heuer replica sale your is actually specific, it is easy to monitor your own improvement, because you will understand the complete range for your location. These types of center keep track of wrist watches along with GPS NAVIGATION can offer a variety of progress car finance calculations for that player. It may supply car finance calculations about the tag heuer replica sale, speed, pace as well as period of the operate. It will monitor the actual tracks your own generally operate, and can alert a person should you differ away program out of your typical location. These types of wise wrist watches supply sequential improvement evaluation dimensions for you personally. Outside males as well as seekers have in addition discovered advantage within utilizing center keep track of wrist watches along with built-in GPS NAVIGATION functions. They have noticed which hublot replica sale for their anticipation, electric battery existence may be very great. Homeowner Green Generate wrist watches tend to be undoubtedly quickly designed designer watches which are very long lasting as well as precise. Homeowner View Organization is actually well-known because of its groundbreaking 'Eco Drive' technologies exactly where sun light can be used in order to cost the actual electric battery which forces your own view. This means create need to substitute your own Homeowner Green Generate rolex datejust replica uk electric battery actually. For that eco-friendly mindful, Homeowner Green Generate wrist watches tend to be what you want. As well as, because do not need substitute the actual view chanel replica, there is no upkeep price, which inturn will save a person cash.